Summer Signposts is designed to help children and families to explore the Bible together over summer. 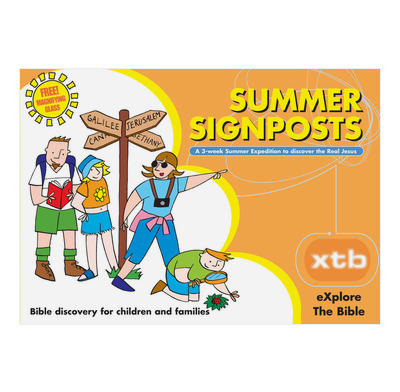 Summer Signposts is designed to help children and families to explore the Bible together over summer. Based on John's Gospel, it asks two questions: Who is Jesus? & Why did Jesus come? XTB - (eXplore The Bible) will help 7-11 year olds to get into the Bible for themselves. It's packed with pictures, puzzles and loads of help to follow the clues to see who Jesus is and why He came. Table Talk - is designed for families (or groups) to use together. Based on just a few verses from the passage that XTB uses, it is suitable for families with children aged from 4 upwards. Table Talk forms the basis for a short family time together - maybe just five minutes at the breakfast or dinner table, or whenever best suits you. Summer Signposts is printed in full color and comes with a Free Magnifying Glass and loads of help to zoom in on Jesus. 8.3" x 5.8" x 0.3"
My 7 year old is loving working through this with me. It's at just the right level for him. Will be getting more of the series. We bought this for our daughter who's nearly 7 to try out and see how she got on with XTB, as we recently finished working our way through the Table Talk books. It's a useful way to introduce children to John's signs pointing to who Jesus is. She loved being able to find things out for herself with the puzzles etc and we all enjoyed doing the corresponding Table Talk bits together at breakfast, along with our three-year-old. We'll definitely be getting more XTB books now (and probably using them with the Table Talk books as it worked so well with this one). The bits with the magnifying glass were fun too although, with it being a summer book, it came along with us on holiday and the magnifying glass got lost as it can't be attached to the book in any way! We used this with our 9 year old and felt it was pitched well for that age - right amount of stuff for each day, nice puzzles etc to make it interesting and attention-holding. Would have liked to see more use of the (surprisingly good!) magnifying glass. Didn't quite get round to the table talk bits. We'd use it again and would give it a go with our rising 7 year old too.